If you’re looking to become a scuba diver, this is the course for you. By the end of the course, you will have completed at least 4 ocean dives and be ready to dive safely and confidently in the future. 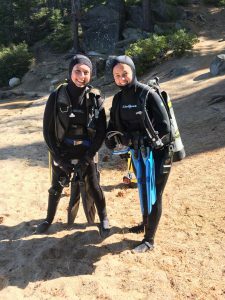 Prior to the ocean dives, we will complete a rigorous course of relevant academic content and thorough skills practice in a swimming pool or other confined body of water. This class usually requires at least 4 full days – spread out or consecutively. Prices for this course vary based on group size, location, and equipment and facility rental needs. Get in touch to schedule your scuba diver course! Weekday, weekend, and holiday dates available.